Why Can't You Go Space Diving Yet? 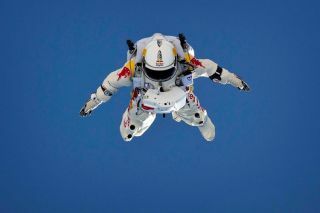 Pilot Felix Baumgartner performs freefall tests in Taft, California, USA on June 21, 2012. An upcoming plunge from a balloon could break the world record for skydiving. But the world may have a long wait before the age of true "space jumps." The Red Bull Stratos "space jump" planned by Austrian skydiver Felix Baumgartner, 43, won't actually be from space. The Oct. 8 stunt takes aim at an altitude of almost 23 miles, or 120,000 feet (36 kilometers) — well short of the altitude where space begins, 62 miles, or 327,000 feet (100 km), above Earth. Higher jumps probably would require expensive rockets and specialized space-diving suits — not to mention a thriving commercial spaceflight industry with paying customers — to become a reality. Baumgartner will be wearing a pressure suit similar to what supersonic SR-71 Blackbird pilots once wore. At higher altitudes, however, "the suit stops needing to become a pressure suit and starts needing to become a small spacecraft," observes Jeff Feige, chief executive of spacesuit maker Orbital Outfitters. Orbital Outfitters has worked on spacesuit designs for both NASA and commercial spaceflight companies such as SpaceX. But it also has considered suits that could work for "space-diving" from suborbital or orbital vehicles, whether for emergency escapes or for thrill seeking. "At high altitude, you go faster and faster and faster before you hit the thickening atmosphere," Feige told TechNewsDaily. "You'll have control issues in vacuum, and then you get the atmosphere." High-altitude space jumping also would require rockets and suborbital flight vehicles similar to the ones being built by space tourism companies such as Virgin Galactic and XCOR Aerospace, Feige said. Jumping off a fast-moving rocket ship rather than a relatively stable balloon would represent a whole new challenge for would-be space divers. Feige likes to refer to spacesuits as integrated parts of spaceships rather than the "clothes you wear on launch day" — his way of saying that spacesuits must be tailored to the specific characteristics of each vehicle. Space diver suits may share the same fundamental technologies but will require different characteristics for leaping from an XCOR Aerospace vehicle traveling in a parabolic curve versus one of Blue Origin's straight up, straight down flights. A space-diving exit from a spacecraft in orbit may end up making less sense than just using entire capsules as escape pods, Feige said. But he and Orbital Outfitters still see the potential use of space-diving suits as backups for suborbital flights. If the Red Bull Stratos jump succeeds, video footage of Baumgartner free-falling in his full-body pressure suit and helmet undoubtedly will inspire people around the world. But the attempt by itself barely scratches the technological challenges of true space-diving. And a single-person stunt is a far cry from a space-diving industry. "Everything goes slower than you want it," Feige said. "For the space-diving stuff, the business case isn't there yet, even if it's technologically achievable." The commercial spaceflight industry remains small and relatively untested, even if it has grown through the big-dollar bets of wealthy entrepreneurs such as SpaceX's Elon Musk and Virgin Galactic's Richard Branson. Space-diving suits as emergency escape options may make business sense only after spaceflight firms have launched more than a few space tourists and astronauts on suborbital flights. "Our fortunes wax and wane on people actually doing stuff and flying and having money to buy stuff," Feige explained. "Right now it's still a very hard and tight market." Still, Feige pointed to the skydiving business as a possible model for space-diving. Parachute makers originally supplied parachutes as emergency equipment for military and civilian pilots, but recreational skydiving eventually spun off as its own profitable industry. Similarly, space-diving suits initially designed for astronauts or space tourists could someday spawn a recreational space jump industry for more people than just sponsored daredevils.